Mindfulness is as simple as engaging fully with the present moment. This takes practice. It also means you must trust your senses. 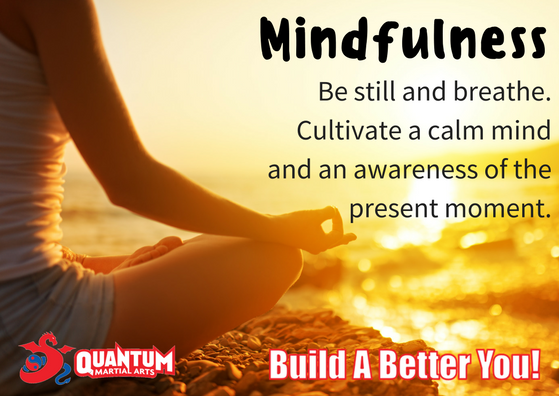 A state of being mindful is hard to sustain – often it is punctured by thoughts – current problems, dwelling on the past or worrying about the future. We all have these thoughts. However, we can all also train to focus on the present moment, rather than focusing on worries or problems. Our practice of martial arts presents opportunities for mindfulness. Hard training forces you to focus on the ‘here and now’ of the workout. Over time and with training we learn to ‘see’ our own “reflexive” thinking and to separate it from the mindful awareness of the present moment. We can begin to cultivate a ‘mental ready stance’ which is calm and steady, even in stressful situations.